Pullela Gopichand, the driving force behind some of India's brightest badminton talents, stepped onto the badminton court 14 years after his retirement. Gopi teamed up with a young shuttler and took on Danish legend and rival from his playing days, Peter Gade in an exhibition match. Gopichand has trained (and continues to train) players like Saina Nehwal, P. V. Sindhu, Kidambi Srikanth, HS Prannoy, and Sai Praneeth, among others. He is the chief coach of the Indian badminton contingent, and founded the Gopichand Badminton Academy in Hyderabad. Gopichand is taking part in the Legends’ Vision World Tour, which will also see the likes of Lin Dan, Lee Chong Wei and Lee Yong Dae in action. The players were in Mumbai to promote the sport globally. They aim to build on P. V. Sindhu and Nehwal's successes and overtake cricket to become the most popular sport in the country. The first leg of this unique World Tour was held in Japan in September, and the final leg will take place in Paris next month. Gopichand and Gade have clashed four times in their careers, and Gade won three of those encounters. 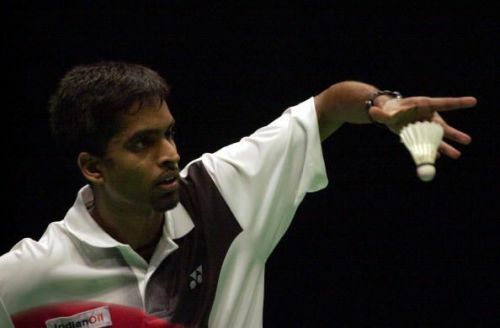 However, Gopichand's solitary win was in the All England Open Badminton Champtionship semi-final in 2001; Gade may have had the statistical edge, but Gopichand won when it most counted, and he went on to win the title, only the second Indian to ever do so. At the exhibition match that took place in Mumbai on Saturday, Gade and his partner got the better of Gopi and his teammate, beating them 9-4. To fans, the outcome really did not matter, because they got to see the Dronacharya of Indian badminton shake off the rust and battle it out on the court once again. While the national games are coming up, Gopichand and his players will have their eyes on the las three Superseries events of the year. First, they are set to play the China Open and the Hong Kong Open later this month, followed by the season-ending Dubai World Superseries, in December. Seeing a legendary badminton player of Gopichand's calibre is a sight to behold, and this exhibition match is one that all fans of the sport will cherish for a long time to come.